In case the tattoo didn't do the trick, Brody Jenner found another way to publicly show his affection for Canadian girlfriend Avril Lavigne. 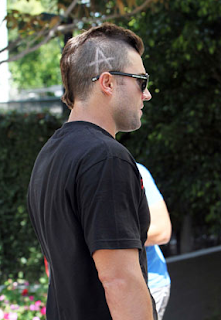 The quintessential California boy, clearly enamored with his new love, shaved an "A" into his newly styled mohawk. The couple's PDA is restricted to Brody's body for now, but where's Avril's support for her beau?